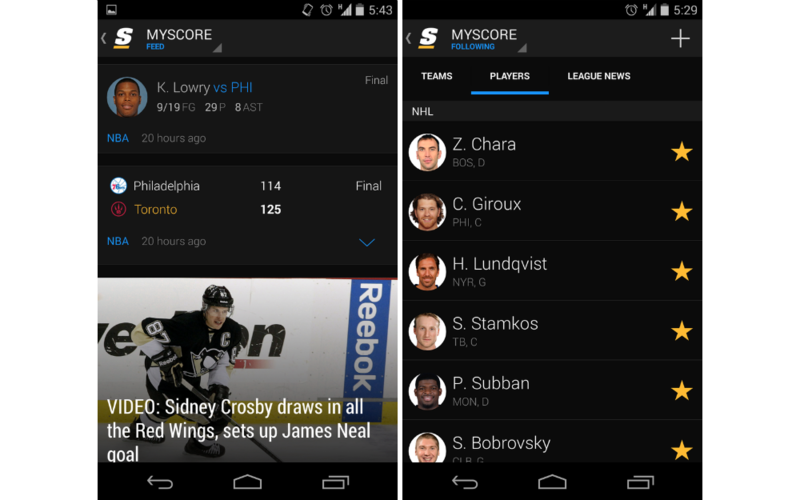 theScore, an Android app which brings all things sports to your fingertips, is set to receive an update today through Google Play. The update brings one major feature, which is a new customizable “Feed.” The Feed will take any teams, sports, or players you have selected, then compile an easily digestible list of news and stats surrounding those selected favorites. What users will probably like most is that during game time, Feed updates itself automatically, featuring posts that are taking place in real time. Feed truly comes into its own during game time – it allows the user to follow multiple games, story lines and player stats in one easily customizable stream, with information updated in real-time and pushed to the top of their Feed as soon as there’s a development. It’s particularly useful for fantasy league tracking, telling you as soon as one of your guy has made a major scoring play. theScore states that the update should hit Google Play today, and with the NBA and NHL Playoffs in full swing, keep your eyes peeled.